Reuters is now reporting that Mexico is going to deport approximately 500 migrants who violently tried to storm the San Ysidro port of entry Sunday. This is in response to the illegal and violent actions of the migrants. If there was ever a reason to build a wall and prevent such lawlessness from occurring, the time is now. No one has a problem with legal immigration, this is not it. Mexico will deport migrants from a group of 500 who on Sunday tried to “violently” and “illegally” cross the U.S. border, the Mexican Interior Ministry said in a statement. From the UK Daily Mail, President Donald Trump threatened to permanently close the U.S. border with Mexico on Monday, saying he’ll take the drastic action if members of a swelling migrant caravan are not deported back to their Central American homelands. Following the actions of this weekend where U.S. Border Patrol fired tear gas canisters and rubber bullets at a group of migrants as hundreds tried to storm the border and who also threw ‘projectiles’ that hit border officers. This nonsense must come to an end. Why would anyone want such people in the United States who would act this lawlessly? At some point the people of the United States need to figure out whether we are a sovereign nation and conduct ourselves under the rule of law or if we are a third word country where anything goes. If we have no borders, then I also assume the assumption is there are no state borders and all property lines and fences mean nothing as well. SCOTUS VICTORY FOR TRUMP TRAVEL BAN … MAKING AMERICA SAFE AGAIN. VIA CNBC, On Tuesday the SCOTUS ruled 5-4 in favor of President Donald Trump’s order to restrict travel from several seven countries to the United States. Those countries include, Iran, Libya, North Korea, Somalia, Syria, Venezuela, and Yemen. As reported by CNBC, “The [order] is expressly premised on legitimate purposes: preventing entry of nationals who cannot be adequately vetted and inducing other nations to improve their practices,” Chief Justice Roberts says. “The text says nothing about religion.” President Trump lauded the victory, while the LEFT lost their collective minds. The Left and the MSM call it a Muslim ban even though according to the Pew Research Center in 2010, there were 50 Muslim-majority countries in the world. According to the math, only 90% of Muslim countries are not on the banned list as not even the LEFT could say that North Korea and Venezuela were Muslim counties. The LEFT loses their mind over this travel ban, seriously? Let’s take a look at those on the list, Iran, Libya, Somalia, Syria, and Yemen. Iran, the number one state sponsor of terrorism in the world. Really, we should think that they are properly vetting individuals, really? Libya, thanks to Obama’s destabilization of that country, it is in chaos. Somalia? Do we even know who is running it other than war lords? Syria, and Yemen? C’mon folks. But as per CNN, President Barack Obama did the same thing and had many of these same countries on his ban list. So why is the LEFT all of a sudden going crazy when the Obamamessiah pretty much did the same? TDS of course. PRESIDENT DONALD TRUMP, DOING THE IMPOSSIBLE … TWITTER NOT SO SOFTLY AND CARRY A BIGGER STICK!!! President Donald Trump has forced the North Korean dictator to the table. During an announcement at the White House Thursday night, South Korea announced that President Trump will meet with North Korean dictator Kim Jong Un by May. It was also announced that Kim Jong Un is open to discussing denuclearization. The LEFT and the MSM were wrong again. The Negotiator in Chief has brought North Korea to the table. It was not through cowardly talk and bribes of paying off our enemies, like previous presidents have done, but tough talk (Video). The decision to meet with Kim Jong Un in the coming weeks was one that President Donald Trump made “himself,” U.S. Secretary of State Rex Tillerson said Friday, attributing the move to a “dramatic” change in posture by the North Korean leader. There currently are no plans to change U.S.-South Korea military exercises nor is their a commitment by Kim Jong Un to stop his nuclear testing. President Trump has agreed to meet with North Korea’s Kim Jong Un by the month of May, says South Korean National Security Adviser Chung Eui-Yon. Following the announcement, even CNN’s Erin Burnett begrudging admitted that Donald Trump would go down in history as a “great President” if the talks lead to peace between North Korea and the world. She stated, “there is no way around that, that is the reality here”. Watch the video at The Gateway Pundit, WOW!!! 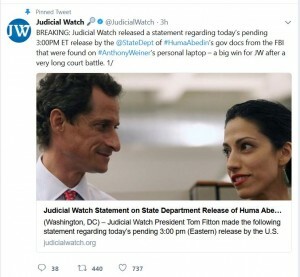 5 CLASSIFIED EMAILS FOUND ON WEINER’S LAPTOP!!! 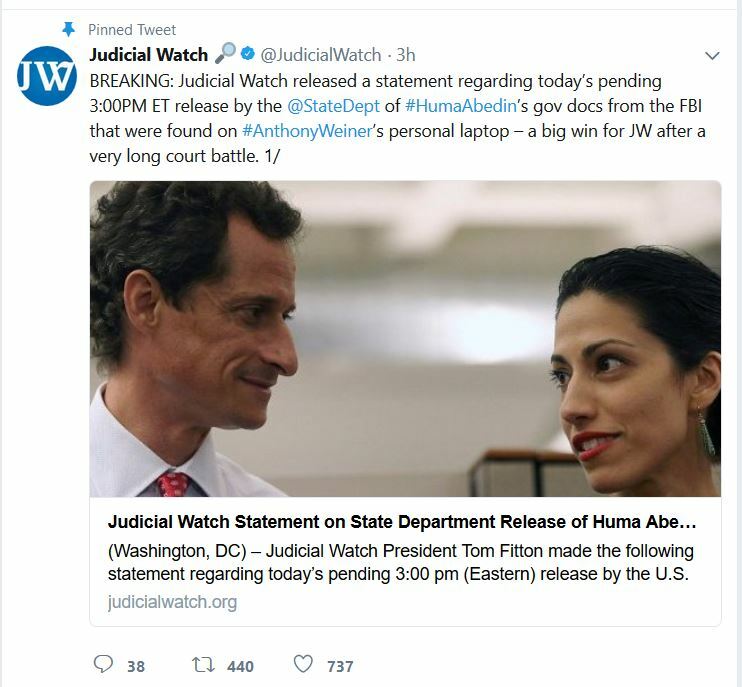 As reported at the Daily Mail, of the 2,800 of Huma Abedin’s work-related emails and documents that the FBI found on disgraced husband Anthony Weiner’s computer, 5 were deemed to be classified!!! The FBI found five classified emails about delicate talks with Middle East leaders including some from Israel, Hamas, Saudi Arabia and the Palestinian Authority. How were all off these individuals not prosecuted for this? Favoritism and a double standard from James Comey’s bias FBI of course. 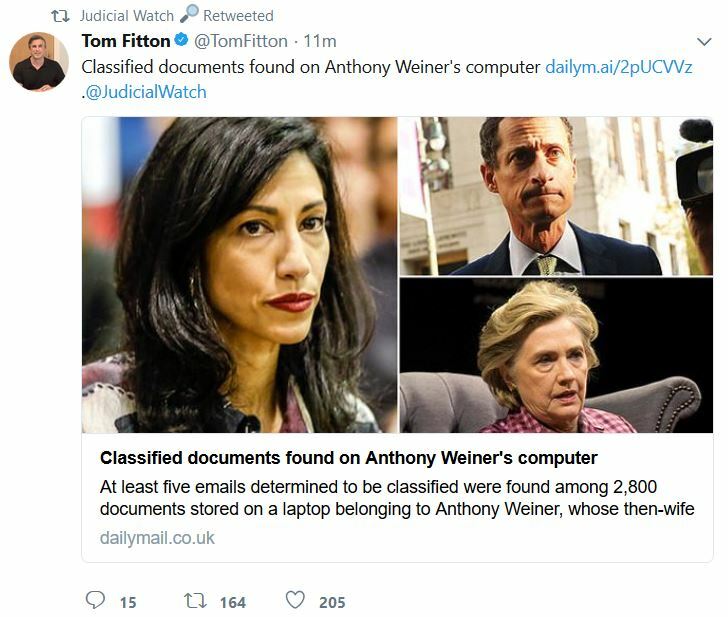 And who was at the center of these classified emails, Hillary Clinton of course. Which can further explain the lack of prosecutions and investigations from Comey’s FBI. Now, where is the Attorney General? These are the crimes that need to be prosecuted, one that involve putting our national security at risk, not a bias, political witch hunt like the Mueller investigation. Paging Attorney General Sessions, where are you? A third is a detailed rundown of issues Clinton was expecting to address during a call with Saud bin Faisal bin Abdulaziz Al Saud, who served as Saudi Arabia’s foreign minister until 2015.